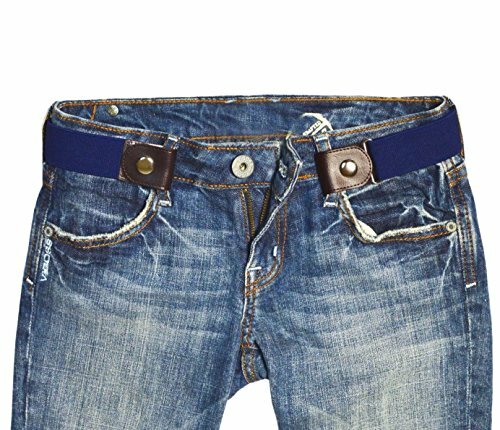 FreeBelts - Buckle-Free Easy Comfortable Belt. No Bulge, No Hassle. Unisex. EXCELLENT QUALITY: Custom-made, highest quality elastic weave for great support. Individual handmade craftsmanship. You'll be impressed! 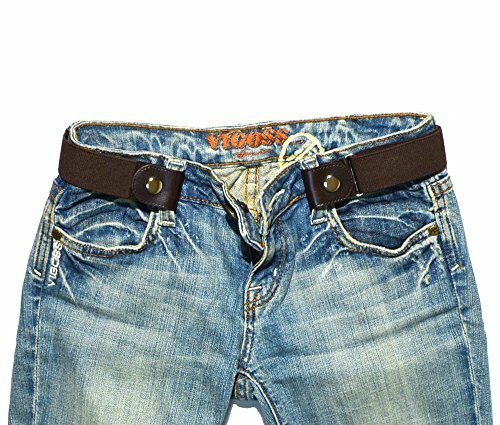 ☞Buckle Free Belt☜ - The new innovative effortless solution than traditional belt,will not fiddle with the buckle any more when you put the buckless belt on your jeans. Makes your life more easier. 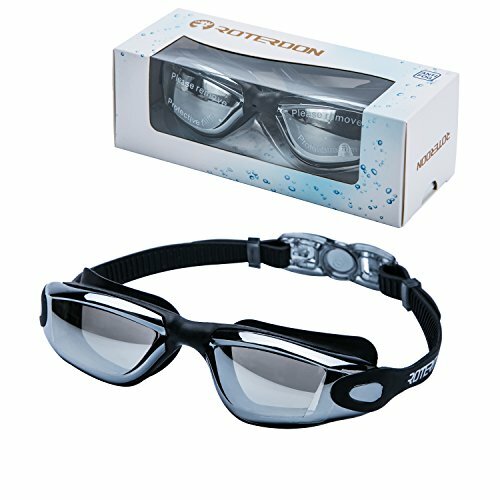 Extremely easy to use! Enjoy Your Life, Save Your Time. 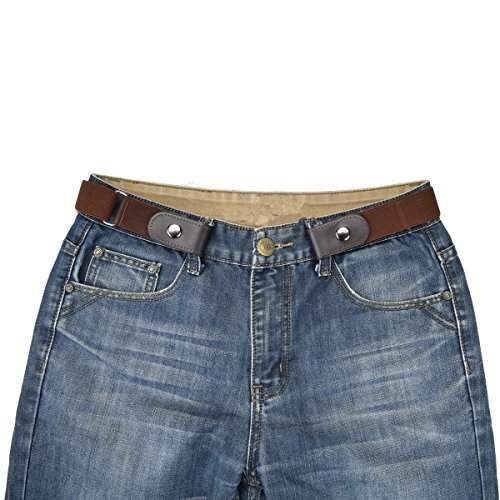 ☞Invisible Belt☜ - No bulge, no hassle any more.The stretchy elastic no show belt lay flat under your shirt or jacket without any buckles digging into your stomachand. Keeping far away from bulky buckle.No need to buckle and unbuck a belt when you go to bathroom. Simple Design Makes Your Life Simple. ☞Comfortable Elastic Belt☜ - No Buckle Stretch belt is made of well-made elastic belt and quality leather.Snap on once, you will forget wearing a belt all day,brings your a comfortable wearing feeling.It's also a nice gift for the person who you concern. ☞Easy Use Belt☜ - Just snap the button one time, extremely easy to use. A bonus circular buckle gives one more ways to match your jeans or dress.The flexible size belt up to 48" with a adjustable buckle, you can adjust a suitable size as your needs.The simple design with elastic band perfect for maternity,special needs men or children. ☞Outstanding After-Sales Service☜- 100% satisfaction guaranteed, 45 days free exchange and returns, plus 360 days warranty.We aims to provide quality products to you, we will answer you within 24 hours even on holiday if you have any problems or questions. We always stand behind our products, just feel free to purchase. QUALITY PU LEATHER: These gorgeous belts for women are made with high quality PU Leather for smooth feeling. 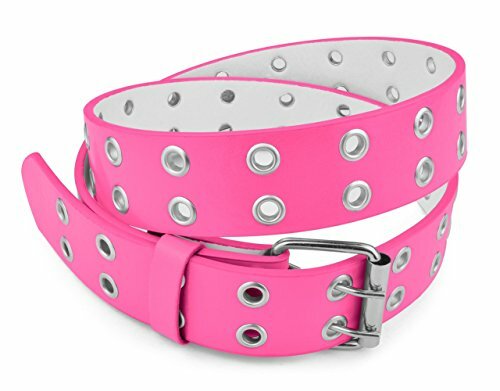 These woman ' s belts are available in many solid and vivid colors including black, white, gold, red, navy blue burgundy, tan, brown, purple, pink, etc. 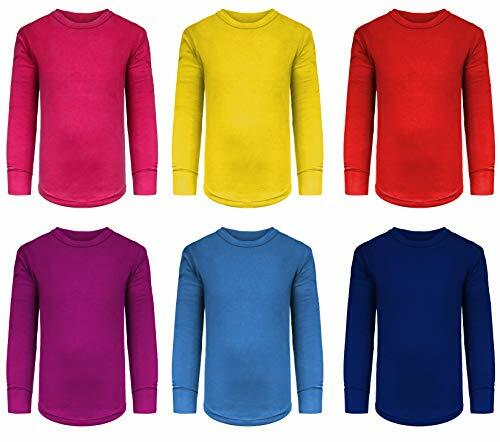 They are also available in variety of sizes from small to big and plus size which are perfect for girls and women alike. 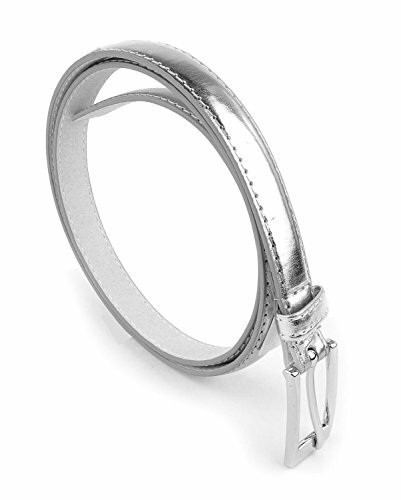 SILVER POLISHED BUCKLE: The silver polished square metal buckle really complements this belts style and keeps belt secure around your waist. 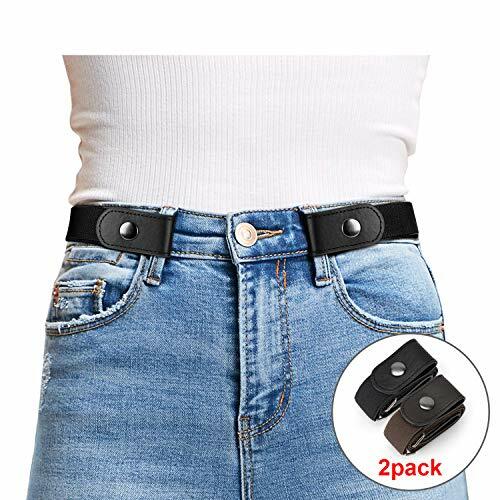 PERFECT SIZE BELT: These womens belt measure as 3/4 inches Wide so you know it will easily fit in loops without damaging the belt. No more hassling to try and make them fit. You will sure to attract lot of compliments while wearing this belt. A must accessories in ladies wardrobe. A fashion designer quality and look at fraction of price. 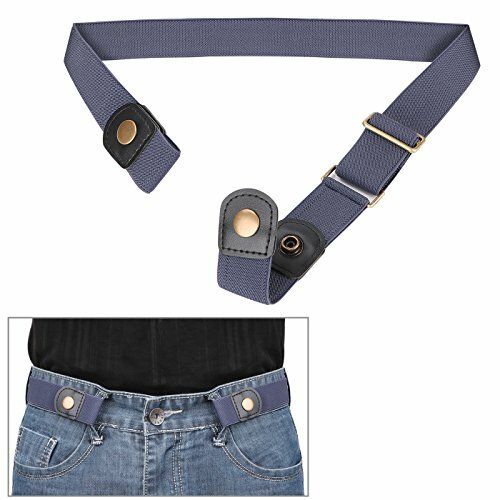 &#x1F331; Stretchy Belt Strap- Super comfortable and soft elastic strap for men,a fantastic stretch web belt with high quality durable leather for the whole family. No curb,hassle and buckle bulge,allows free and casual movement. &#x1F331; Snap Design- Practical snap makes it totally buckle free. 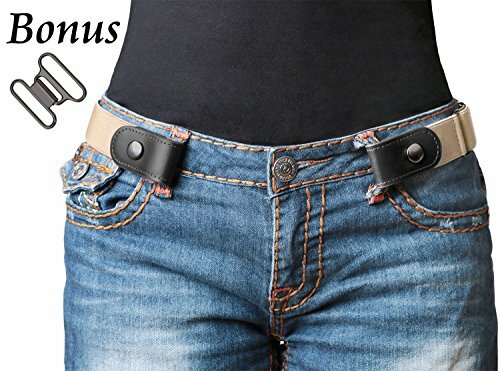 Not only a perfect belt for jeans,but also a fashion accessory for pants. No more need to repeating taking on/off your traditional leather belt again and again every time you wanna use the washroom. &#x1F331; Adjustable Size- S: Pants Size 30"-48",L:Pants Size 39"-61". If you are not sure about the size, go bigger. If it's too large or small for you,just adjust it by sliding the metal bar and you'll get the right size.Please make sure if the size range will fit you well before the order,since it may add some stress on your pants loop if you keep it too tight. &#x1F331; Package & Service- This buckle free men web belt is enclosed in an elegant and lucky bag with an instruction. It will be the best gift for your dad,husband,boyfriend,brother and best men friends. After sales service guarantee,please feel free to contact us if any problems. &#x1F331; Reinforced Hardware- We use solid snap,not easy to fall off and rust. Thickened metal bar to fix the length more tightly and adjust the length easily. 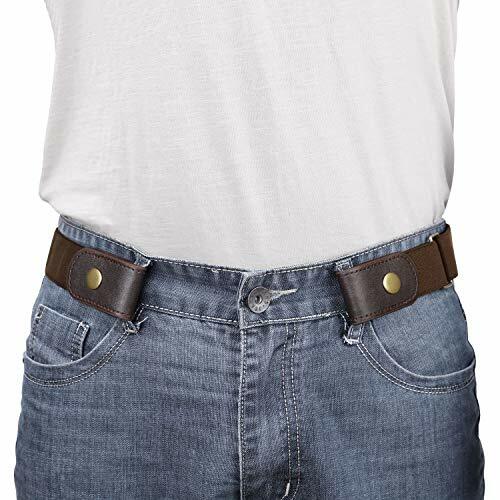 This free buckle men belt is very convenient to take on and off. Elegant espresso maker body through polishing design, three ring precision thread and imported safety valve to make your use process more secure. The advanced sanded handle has excellent thermal insulation effect, and the curve of the handle is ergonomic. The moment of use will bring you to the Roman restaurant in the morning. 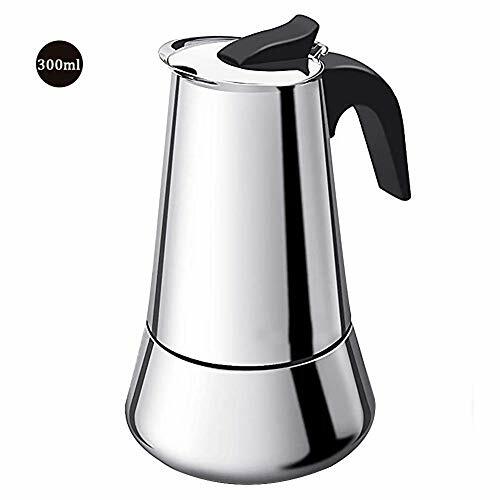 With a quick and even heating, accompanied by a strong aroma, espresso maker can make you a pot of 6 cups (300ml) of gourmet espresso in just five minutes, and you'll be instantly impressed by its rich taste and aroma. It can be heated by induction cooker and open flame. The brewed coffee has rich taste, easy operation and easy cleaning. If you love and enjoy the happy life of coffee, the quality of espresso coffeepot is definitely a top priority. Espresso maker is made of food-grade safe 430 stainless steel and has strong anti-corrosion and rust resistance. Because use high quality material to make the extraction pot hole, make the coffee that makes more mellow, bring high quality coffee to you to enjoy. ☘ Adjustable Size- S: Pants Size 24"-36",L:Pants Size 34"-48". If it's too large or small for you,just adjust it by sliding the metal bar and you'll get the right size.Please make sure if the size range will fit you well before the order,since it may add some stress on your pants loop if you keep it too tight. 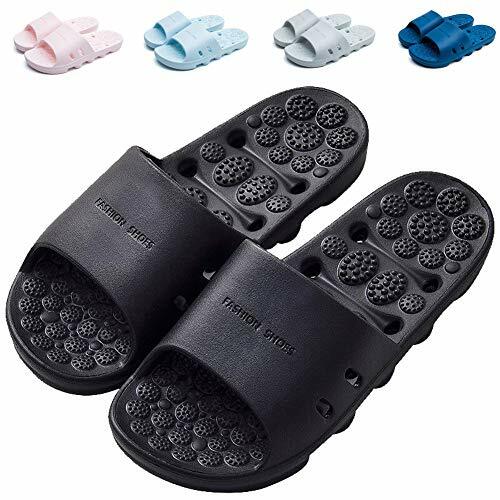 DRAINAGE HOLES DESIGN: Our shower slipper is special in "drainage holes" in the soles, adopt "holes" to dry the water quickly sweat drainage while keeping your feet comfortable, you will not afraid to be sticky wet all the time. Keep drying after you finish your shower and swimming. MASSAGE FOR YOUR FOOT: The surface sole of bath slipper featured with bulge and small little dots to and distinctive convex dot design of the soles gives you a comfortable massage experience that helps you promote blood circulation, relax yourselves and keep healthy while walking. ANTI-SLIP DOTS DESIGN: Soles are dots design, and it is attractive that it is anti-slip even when it's wet on the inner sole and outer sole. So it is safe to have a nice shower. Stripe and unique upper design give you relax! The bath slipper will protect your feet healthy with antibacterial function. SKIN AND ENVIRONMENT FRIENDLY: Select high elastic rubber and plastic material, lightweight and wearable, anti-skid out-sole offer you an safe environment, especial in the bathroom. 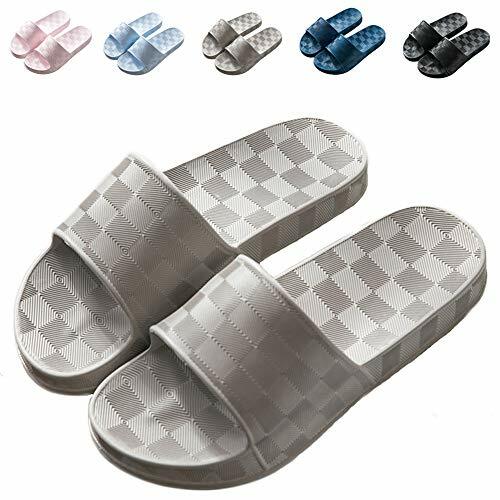 The tactile impression of our slippers are super soft and the design are perfect fit your feet shape and let you enjoy the comfort of these slippers after a long day of work. 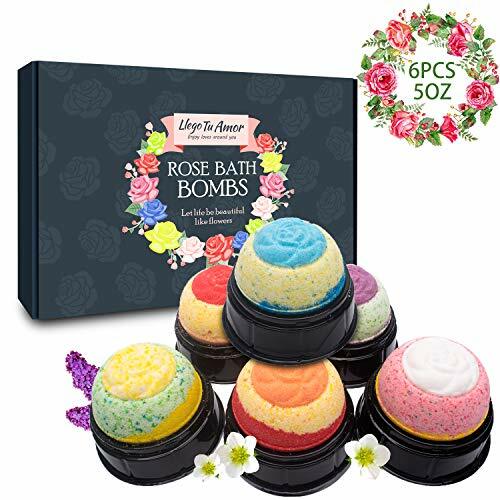 SUITABLE FOR MANY OCCASION: Perfect For Summer, Spring, Autumn and Winter, Indoor bedroom, Bathroom, Living room, Spa, Bath, in the room, veranda, beach sandals, cafes and restaurants, hotels, massage shops, after sports and after bathing, after showering, and many other occasions! Gym, Swimming pool, Beach, Holiday, Leisure, etc. 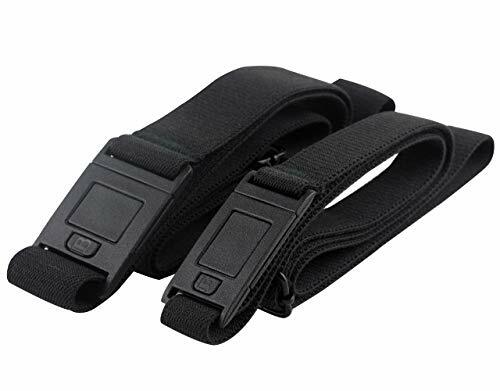 ☘ Stretchy Belt Strap- Cost-effective 2 Packs. 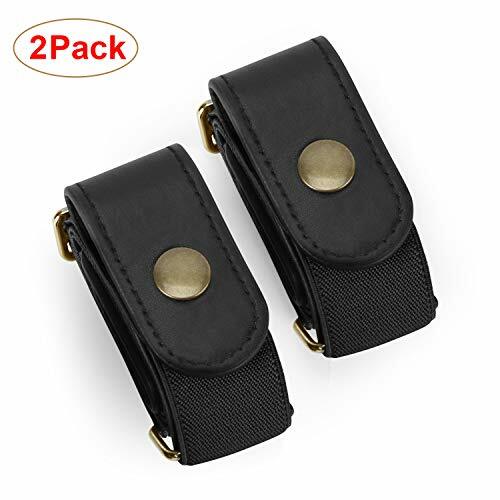 Super comfortable and soft elastic strap for women/men/child and the old,a fantastic stretch web belt with high quality durable leather for the whole family.No curb,hassle and buckle bulge,allows free and casual movement. ☘ Adjustable Size- L: Pants Size 24"-36",XL:Pants Size 34"-48". If it's too large or small for you,just adjust it by sliding the metal bar and you'll get the right size.Please make sure if the size range will fit you well before the order,since it may add some stress on your pants loop if you keep it too tight. &#x1F4CC; Pls be aware that it would add stress on your pants loop, but it could be reduced by using our interlocking clasp. 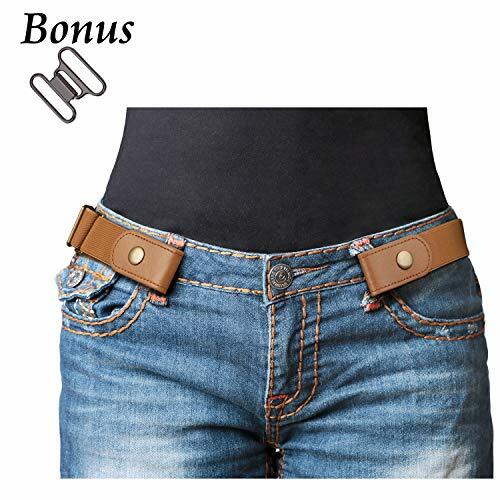 ☘ Stretchy Belt Strap- Super comfortable and soft elastic strap for women/men/child and the old,a fantastic stretch web belt with high quality durable leather for the whole family.No curb,hassle and buckle bulge,allows free and casual movement. ☘ Adjustable Size- S: Pants Size 24"-36",L:Pants Size 34"-48". If you are not sure about the size, go bigger. If it's too large or small for you,just adjust it by sliding the metal bar and you'll get the right size.Please make sure if the size range will fit you well before the order,since it may add some stress on your pants loop if you keep it too tight. ➽Easy Use Belt to Make Life Easier - To use this elastic belt, just snap on once and forget you're wearing a belt all day. Hassle-free dressing, save time for bathroom breaks! 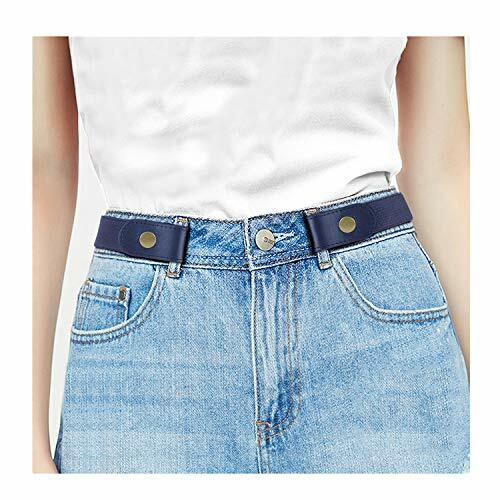 ➽Buckle-less Belt, Looks Almost Invisible - No buckle belt, there's no bulge and no flap on the side. 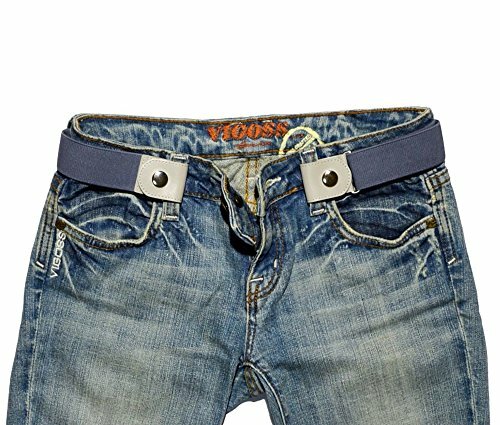 This belt for jeans is very low-profile and keeps pants in place well. 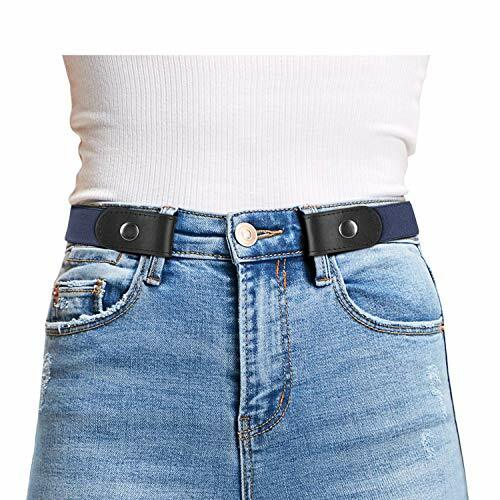 ➽Quality Stretch Belt, Incredibly Comfortable - This women belt is made of high quality elastic material, it's very soft and comfortable. Really relax your waist. 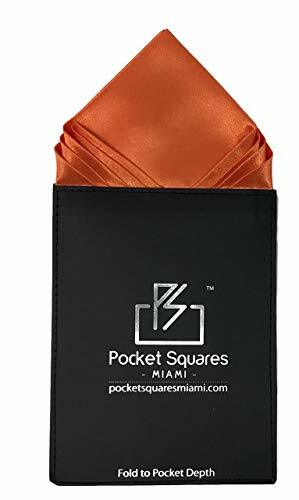 ➽Great for All Families, Excellent Wardrobe Addition - Suit for men and women, for kids from potty-training to school, teenage students, seniors, pregnant, weight changes, special needs etc. So practical! ➽Optional Size, Adjust to Your Most Fit - SIZE ONE fit pants size 26''-36''; SIZE TWO fit pants size 36''- 44'', you can adjust to any your liking size. Belt width fit for most pants loops(elastic part 30mm, leather end 50mm). 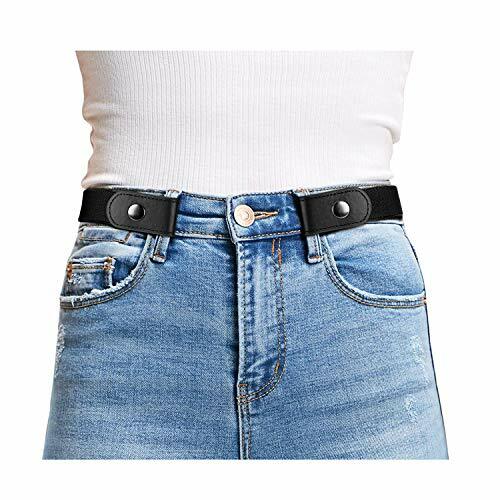 This Buckle free belt solve your problems: Buckle dig into your belly, can't find the right hole to your perfect size, belts pull up your pants all the time, annoy you when sitting, bother of buckling and unbuckling a belt when you go to bathroom. Buckle-less belt - The belt without the annoying buckle. No bulge, no hassle. Adjust to fit well without buckle digging into your stomach. Enjoy Easier Life - The greatest for maternity, slimmer, pregnant, rider and special needs. Invisible - No bulky buckle appears as a lump under your shirts and jacket. Much convenient than regular invisible belt. Adjustable - Easy adjust, fit well for 22"-48"
Easy to use - Just snap closure, the elastic strap provides great support and comfort. 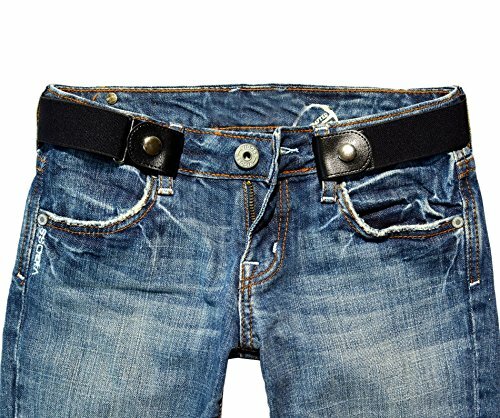 Enjoy stress-free and never pinching by buckle again! LIFETIME WARRANTY from Radmire, RISK-FREE! 100% high quality Genuine Cowhide leather, feels luxury and comfortable. Hand feeling and deeply impressed enjoy. Looks even better after using for a long time. Multifunctional with 12 x Card Slots, 3 x Cash Compartments, 1 x Photo Slot, 1 x Zippered Section, 2 x Bill compartments. Keep your credit cards, cash, coins, notes, receipts, checkbook well organized. Ultra Practical. 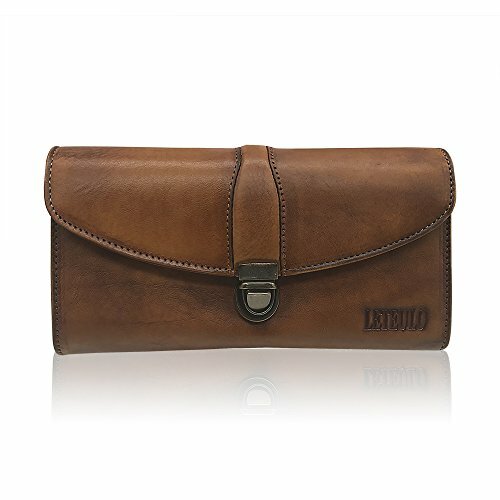 Dimensions: 7.48"L x 3.94"W, It is just the size for a wallet you can simply hold it on hand or put it in bag. &#x1F49D; Stretchy Belt Strap-Super comfortable and soft elastic strap for women/men/child and the old,a fantastic stretch web belt with high quality durable leather for the whole family.No curb,hassle and buckle bulge,allows free and casual movement. 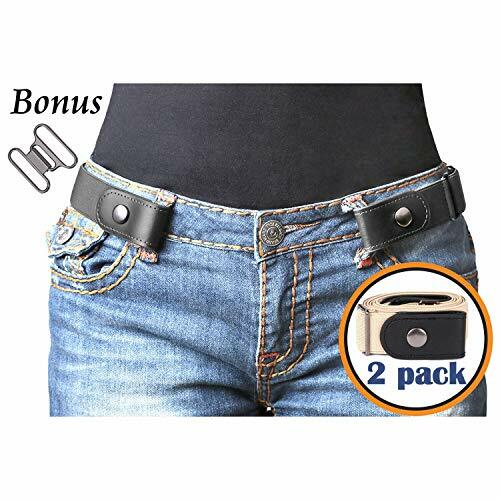 &#x1F49D; Bonus Interlocking Buckle-Practical interlocking clasp makes it two ways to wear.Not only a perfect belt for pants and jeans,but also a fashion accessory for dresses,down jacket,wind coat and sweaters.And it will reduce the stress on pants loop if you use it as pants belt with this buckle. &#x1F49D; Adjustable Size-Suit for Pants Size 24"-48". If you are not sure about the size, go bigger. If it's too large or small for you,just adjust it by sliding the metal bar and you'll get the right size.Please make sure if the size range will fit you well before the order,since it may add some stress on your pants loop if you keep it too tight. 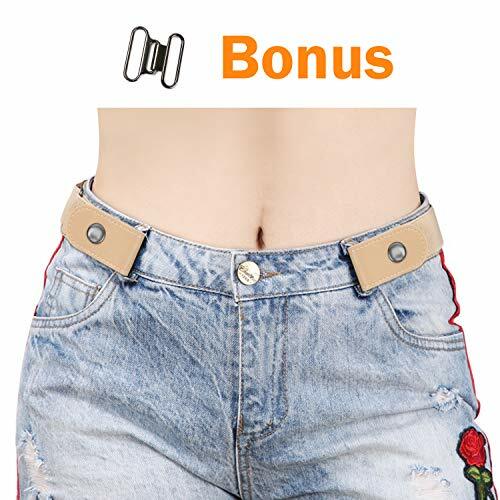 &#x1F49D; Package & Service-This without buckle belt is enclosed in a delicate and elegant gift box with an instruction and bonus buckle.It will be the best gift for your mom,wife,girlfriend,sister and best friends.After sales service guarantee,please feel free to contact us any time. 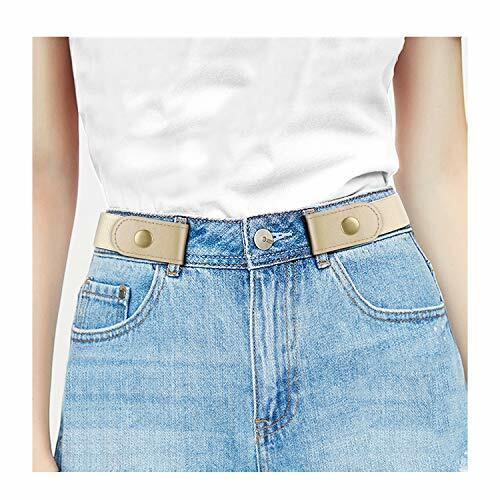 &#x1F49D; Reinforced Hardware-We use solid snap,not easy to fall off and rust.Thickened metal bar to fix the length more tightly and adjust the length easily.This buckle free belt is very convenient to take on and off. All-match Slim High Waist Leggings for Winter- High-quality fabric, uper breathability, feel like your the second layer of skin when you wear them; They are perfect to wear with longer tops, sweatshirts, and sweaters...even everything. You can wear them outside or at home, the high waistband keeps the leggings in place and you can also roll the waistband over. Super soft cozy fleece lined provide you extra warmth for winter. Ultra Soft Comfy Fleece Lined Extra Warm Full Length Leggings- Fleece lined high waist warm leggings, made of premium stretchy fabric - 92% Polyester, 8% Spandex, the fleece inner brings you extra warm without bulkiness, perfect for winter. By tested, this leggings always hold up very well after being washed multiple times without any shrinking and pilling, for the price, you can't go wrong. Premium Stretchy Fabric, One Size Fits Most People - The super stretchy design can accommodate to most body shapes, don't worry about the one size leggings, even you have big thighs or a petite figure, these leggings will definitely fit and make you look attractive. Soft and Delicate, Solid and Durable, Not See Through, No Pilling - The fleece lined leggings are not see through, perfect for everyday casual, running, or any other indoor and outdoor activities in winter. The material are very solid, extremely soft, won't pilling, it's not easy to wear out like other leggings, you also don't have to worry they attract cat hair like a magnet. High Waist With Tummy Control Band - The high waist band holds up waist area well. The extra length on top does help with the tummy, the band is not too thick so it doesn't create a bulge like some tights. The tummy compression make you look slimmer. KEEPS CORDS TANGLE-FREE - This power cord reel keeps your cords organized and ready for action. 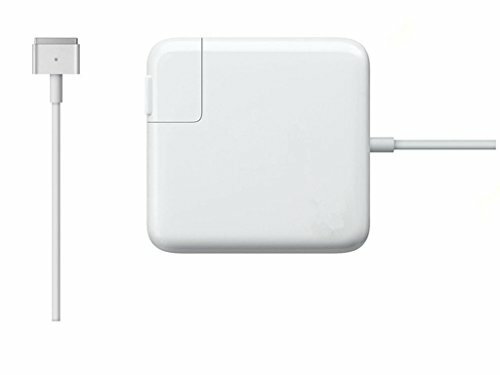 No more hassling with extension cord knots or tangles! HEAVY DUTY POWER - 14 gauge extension cable is perfect for running power drills, table saws, lawn mowers and other heavy duty equipment. 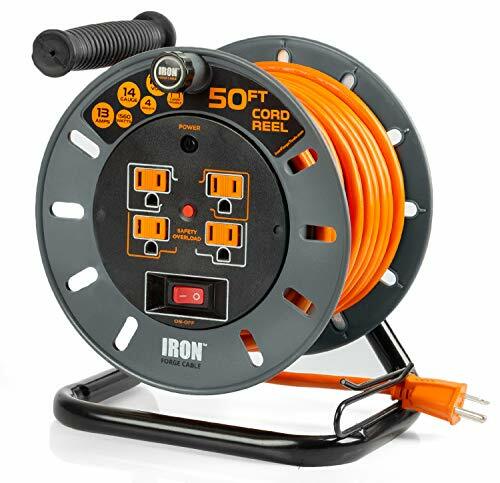 BUILT-IN SURGE PROTECTION - With overload surge protection and a 3 prong grounded plug, this extension cord reel is designed to keep you and your equipment safe. DURABLE STRAIN RELIEF for optimal performance. REINFORCED BLADES protect prongs from bending or breaking. 4 OUTLETS IN 1 - This reel extension cord lets you power multiple devices simultaneously. Includes CIRCUIT BREAKER SWITCH and a CARRY HANDLE for quick and easy transportation. &#x1F338; Men's bikini boxer underwear, breathable and stretchy fabric. &#x1F338; Floral lace see through bulge pouch with suspender, ultra soft and breathable fabric for additional comfort. 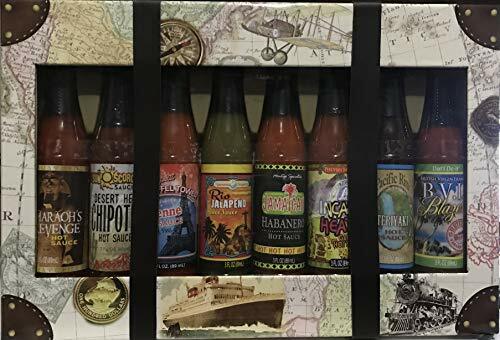 Global Hot Sauce Collection Includes gift case - a great gift idea. Great Packaging! - You will be impressed with how elegant this packaging is. Great for a Christmas Gift, or any time of the year!